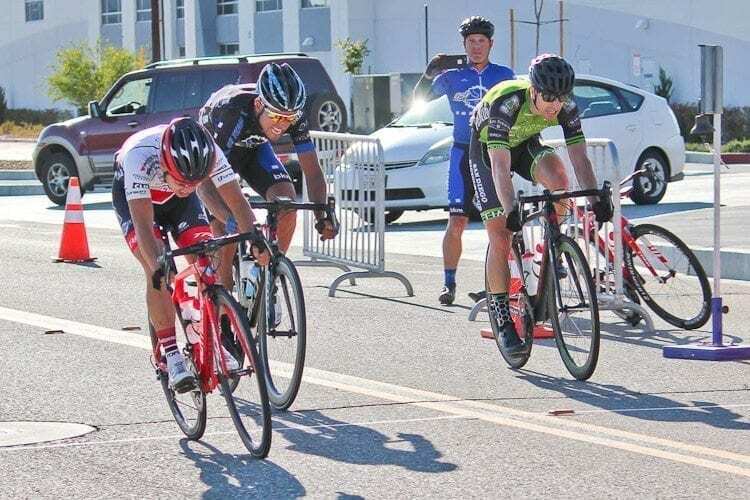 Fresh off racing the Redlands Bicycle Classic, the SoCalCycling.com Team had some great fitness heading into the Victorville Road Race and Criterium. 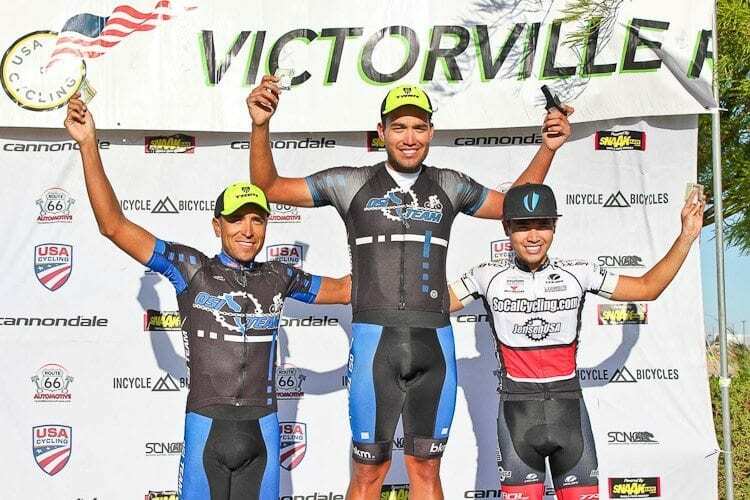 SoCalCycling.com Team member Leo Bugtai shares how the Victorville Road Race played out. 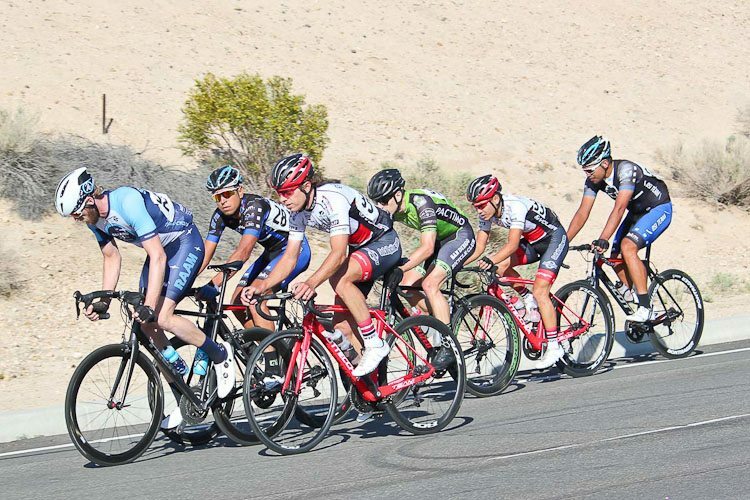 The Victorville Road Race was an 84 mile Road Race that has a technical session right from the start. We would need to do 12 laps of this circuit. Heat and wind were always a factor, but perfect temperatures were in play today other than strong crosswinds. 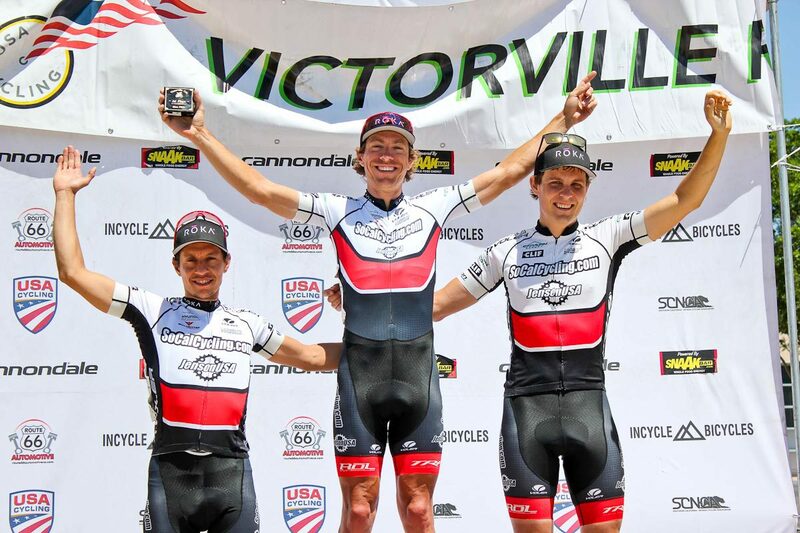 The last two times the SoCalCycling.com Team has done this race we have nailed a spot on the podium “and a win”. Of the two times we did this race the winning break was decided right from the gun. Due to the technical session right from the start, it made for the peloton to be strung out and single file into this section of the road. If you were not in the proper position you’d be caught off guard and gaps would form. With four riders we discussed what would be the plan of action. Ethan Batt and Ben Foster being our biggest hitters on the SoCalCycling.com Team would be the ones drilling it on the front for the first 10 minutes, with Noah Schlosser and myself following moves. When Ethan attacked he lit it up. He was off solo from the neutral start. This allowed for many riders to chase allowing myself and other teammates to follow. Ethan executing the plan perfectly he continued to keep the pressure on. We made the turnaround and Ben Foster would counter-attack with a few riders following with myself included. This would be the 4 man break for the day. A few laps into the race Ben got a flat and Ethan was bridging up to us with a 1-minute gap to close. The peloton was 20 seconds behind him. This allowed me to not be responsible for pushing the pace in the breakaway. Ben Foster got the flat changed and he was now back in the peloton. A few more laps into the race Ben Foster was now the one bridging with another SDBC rider, with another OSI rider right behind them. We decided to wait and there would now be a total of 6 riders coming into the last lap of the race. The last lap Ben Foster would attack up the climb (twice). I told Ben I was looking for the sprint because I knew I could win in that position. After Ben’s 2nd attack, one of the brothers from OSI countered immediately. With no hesitation, I followed, but it still stung the legs. Neutralizing that move the other brother from OSI countered and went off solo for the win. Ben and I were vulnerable and at this point so were the other riders. So we were now riding for second. Coming into the last corner I knew where to sprint and where I would be making my move. Ben setting the pace allowed for no earlier attacks to be made, which allowed me to initiate the sprint and run for 2nd. With almost perfect team tactics. It’s unfortunate we couldn’t get the win, but we recapped and learned. Thanks to the race promoter, Alfie Sanchez at Majestic Cycling, for putting on a great event and of course my SoCalCycling.com Team Sponsors for the continued support: SoCalCycling.com, Jenson USA, Bottecchia, Voler Apparel, Clif Bar, FSA, Gizmo Cycling, Union Sport, Hyundai San Sebastián, ROL Wheels, TRP Brakes, Caravan Canopy, KMC Chains, Bell Helmets, Echelon Design, ROKA, Larsen’s Restaurants and SCC Slick Chain Lube.